The e.One Stream provides access to thousands of albums by connecting your preamplifier or DAC to your home network, Tidal, Qobuz, Vtuner, or your personal NAS library. The Bel Canto SEEK Controller is a UPnP/DLNA iOS app that organizes playlists, favorite tracks, or stations from around the world, making them readily accessible. With the e.One Stream you can see source, sample rate, and file type on the display; volume is controlled using your DAC or Preamp for optimized level control. Design features include a High performance Asynchronous Network Renderer that is a transparent bridge to networked audio. 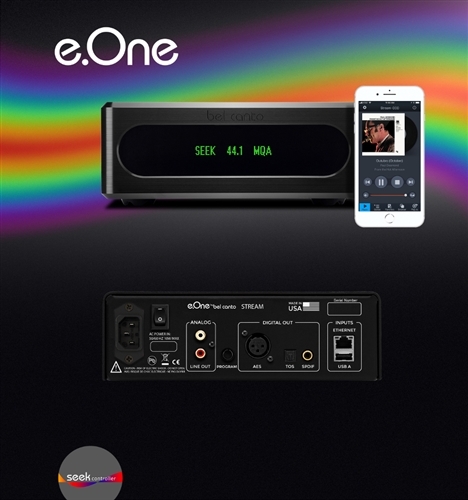 The e.One Stream retimes data for ultra-low jitter and isolation from the network or NAS enviroment, plus robust power supplies create the best signal source for your analog preamp or DAC. Search for "Bel Canto Seek"